Ultimate performance you could only dream of, now for real! Bridgestone will unveil its new Battlax Hypersport S21 radial – a tyre that blends proven wet weather technology and innovative new features, giving impressive performance in all conditions and on all surfaces. The wet weather performance was taken from the well-proven S20 EVO and Bridgestone combined this with innovative new features to improve dry performance and increase mileage. The front tyre is designed with a smaller crown profile for better handling and precision through corners without losing optimum damping and stability. 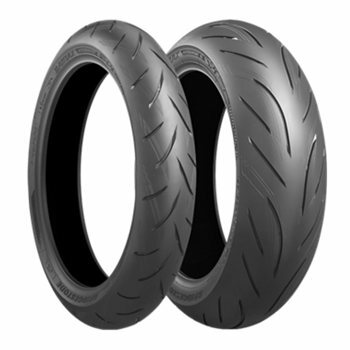 The rear tyre has a larger crown profile which together with the optimised belt construction and groove positioning, upgrades the rear feeling and increases cornering stability. Less slip in the contact area reduces wear, adding to mileage. Both front and rear tyres have a new shoulder compound, which provides a larger contact patch for higher grip, more confidence and faster cornering in wet and dry. The performance of the new Battlax radial has been tested and proven on the track in wet and dry conditions. Testing by Bridgestone versus S20 EVO shows the advantage of greater stability with S21 clocking significantly higher cornering speeds at entry, keeping a sharper line and leaving with faster acceleration, cutting average lap times by almost 2 per cent. Overall S21 represents a real step forward in dry performance – particularly cornering stability and handling. With the added bonus that mileage has also been improved; by 36 per cent. Used you guys now on several occasions for tyres and other bike stuff. Great prices and great service every time.